Christmas came early for me this year in the form of Amazon’s marketing genius. While buying yet another book on writing, I spied an intriguing title under Amazon’s Frequently Bought Together headline: The Emotion Thesaurus. What in the world is that? It’s Christmas, your birthday, your anniversary, and Happy Writer’s Day all wrapped into one beautiful gift from authors Angela Ackerman and Becca Puglisi. These attractive, talented, wonderful, intelligent, funny (No, I don’t really know them, but I’m grateful, okay?) women have compiled a resource that every writer would probably shell out fifty bucks at least for, but Amazon is only asking $12.32. So let me unwrap this divine present from the writer goddesses for you. Pick an emotion that a character would feel. I’m feeling pretty Adoring towards Ackerman and Puglisi right now, so let’s use it. Keep in mind as I take you through this in depth entry for Adoration, that there are 74 more emotions covered in this book. First you get Adoration’s definition. Next comes a list under the heading Physical Signals. This list includes thirty-two outward indicators that a character might be experiencing adoration. These signals would be obvious enough that not only your reader should pick up on them, but the other characters in a scene should be able to observe that the character exhibiting them is Adoring someone or something. For example: lips parting, nodding while the subject speaks, releasing an appreciative sigh, etc. I would have been thrilled with just this first list. Instead of writing telling sentences like, “The heroine adored her big brother and listened to everything he said.” I now had a list that helped me come up with showing sentences like, “Big Brother spoke of his most recent battle, and Heroine listened with her lips parted, nodding encouragement every time he paused.” However, the entry doesn’t stop there. The next heading under Adoration is Internal Sensations. Ackerman and Puglisi give us seven more ways to show Adoration from the perspective of the character experiencing it. This list included descriptors like quickening heartbeat, breathlessness, and feeling one’s pulse in the throat. The authors note that acute or long-term adoration can escalate to Love, Desire, Frustration, or Hurt and give you the page numbers for each of those emotions, so you can look up all the goodies they’ve given you for them, too. The final section of the Adoration entry is Cues of Suppressed Adoration. Nine more ways of showing instead of telling are provided for you. The list includes clenching or hiding one’s hands to hide sweating or shaking, avoiding conversations about the subject, and creating chance run ins. I’d give you another example, but what you really want is the link. Merry Christmas. 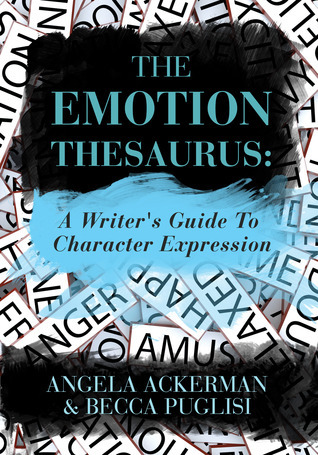 The Emotion Thesaurus by Ackerman and Puglisi. Do you have any other resources that have really helped you? I’m always eager to hear what other writers have found valuable. As I outline my plot, I’ve been using a 3-act method my friend sent me that’s sort of based on screenplay structure from Alexandra Sokoloff’s blog below. Thanks for the tips. I’ll have to check those out. I’ve nominated you for a Versatile Blogger Award because I find your blog thought-provoking and inspiring. Thanks for the nomination, Sara. I gladly accepted, as you’ll see tomorrow. As for plotting/structuring help, I’d suggest Elizabeth Lyon’s A Writer’s Guide to Fiction and James N. Frey’s The Key. James Scott Bell’s Plot and Structure isn’t bad, either, just more simplistic. A copy popped through my letterbox yesterday! And are you experiencing Adoration yet?